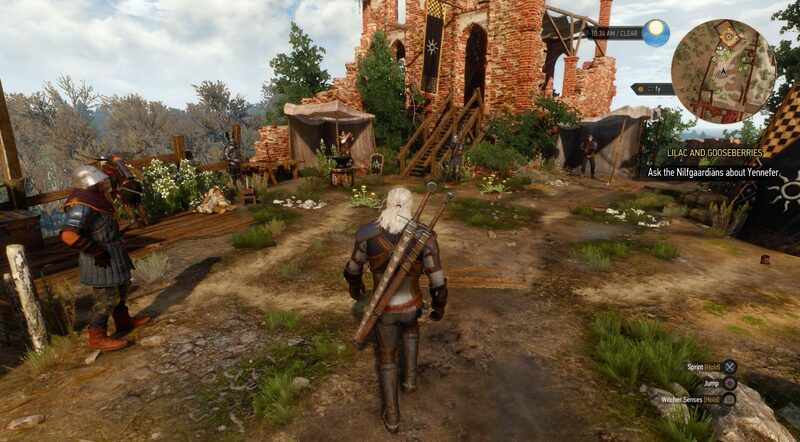 The Witcher 3 is good‐​looking, no doubt about that. Let me first get the boring stuff out of the way so I can start discussing more interesting aspects of my experience. 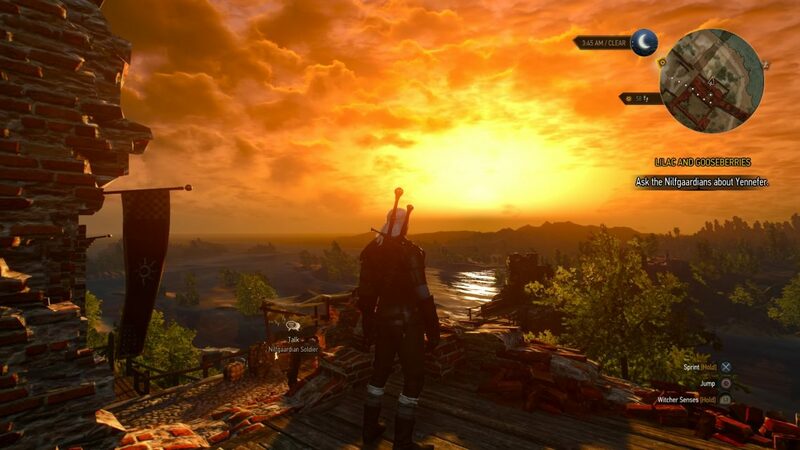 The Witcher 3 is, on the whole, gorgeous. It’s got great graphics. It has the best graphics. It’s graphics are awesome. Yadda yadda. Of course there’s the occasional glitch and other oddities, but anyway, graphics are rarely what makes or breaks a game. The ambient music fits the atmosphere well, but I started getting tired of it a tenth of the way through. Furthermore, the volume is rarely adjusted in dialogue, meaning that if you want to clearly hear everything being said, you sometimes have to be your own sound engineer and turn the music down. Too bad you can’t access the menu (or indeed pause at all) during conversations. The sound effects are satisfying – swords clang sharply against each other, the cutting of monster flesh has just the right amount of wetness, and your Force Shockwave ability booms powerfully as your enemies are sent flying every which way. The voice acting can be disappointing at times, but is mostly just there and not in the way. This is especially true for Geralt’s voice, though that’s likely due to Geralt conveying 1.5 emotions throughout the whole game (“Whatevs” and “Ciri!”). Just like with Skyrim, plenty of voices are re‐​used for hordes of unimportant NPCs, as they have to be in a $60 game of this scale, because budgets are a thing. Conversations are usually good, but I did find myself skipping dialogue on several occasions due to too much lengthy talk about the latest and greatest plot device I had to find. The story is also par for the course, meaning that you’re mostly chasing some macguffin or another, which drives things forward but unfortunately makes it hard to really get into it. Complex, gray‐​scale, meaningful choices having consequences hours down the line have been held up high as a hallmark of the series, but I’ve never found the system to be particularly engrossing or emotionally charged. Do you kill or spare mentally challenged trolls causing trouble for the local populace? Do you hear the other side out, or are you a triggerhappy avenger of the downtrodden? By and large, most of it doesn’t really matter. You killed the sentient trolls? Now who’s the monster, you mutant freak. You failed to save some D‐​list NPC and a related C‐​list NPC committed suicide because of that? Go ponder your failure and the profound fragility of the human condition for a while. See, The Witcher 3 acknowledges the existence of hard choices and moral dilemmas, but rarely has much to say about them. The choices and most of the consequences lack significant depth, and being unable to get considerably invested in the storyline and most of its minor characters, there was usually little on the line for me. Most choices just serve as a means for you to define parts of Geralt’s personality, though there isn’t that much leeway in any direction, what with him being a well established character and all. There is the occasional great side quest, including a rather humorous one about a locked‐​down magical tower where the game is trolling around about DRM and GOG, but mostly, the quests are evidently just there to facilitate the primary gameplay loop: the combat. The combat is system solidly designed, but I would be lying if I said it kept my pulse racing until the end. The combat is fairly entertaining, though even with a flexible leveling system, things can get a bit repetitive. While you can get by with mashing away at the easier difficulties, fights in The Witcher 3 are best enjoyed as puzzles to be solved, where you can equip the right oil, bombs, etc. for an edge against this and that enemy type. With dodging, timing, and reading your opponent being important elements of a fight, it’s not unlike a carefully choreographed dance. But it’s the same same dance over and over again, and the same puzzle every time, so things quickly get a bit tedious. Besides, combat is not that difficult once you master the art of dodging, which is a bit on the forgiving side in this game. Keeping a magical shield up at all times and dodging diligently, I had little trouble completing the game on the highest difficulty. On the whole, in other words, The Witcher 3 is polished to the degree you would expect any modern AAA game. Having established that, let me now get on with ranting about more interesting stuff. There are two main problems with The Witcher 3, which are common to most huge, open‐​world games (HOWGs) I’ve played in the last decade: Firstly, it’s at least twice as long as it needs to be in order to do the good things it’s trying to do, and secondly, there’s this tedious artificial video game layer sitting on top of the whole experience. Let’s talk about the size first. The main problem with the size is that, what with budgets being a real thing and all, there’s a limit to how much unique content you can put into games. Most notably, in order to fill the world with entertaining content, developers have to take shortcuts (such as copy‐​pasting villages and just moving buildings around a bit) and dial back the polish (else we wouldn’t have walk‐​and‐​talk sequences abruptly ending mid‐​sentence when you and your companion arrive at the invisible destination marker). Many villages have a unique feel to them, but most are rather generic clones of each other with few distinguishing characteristics. 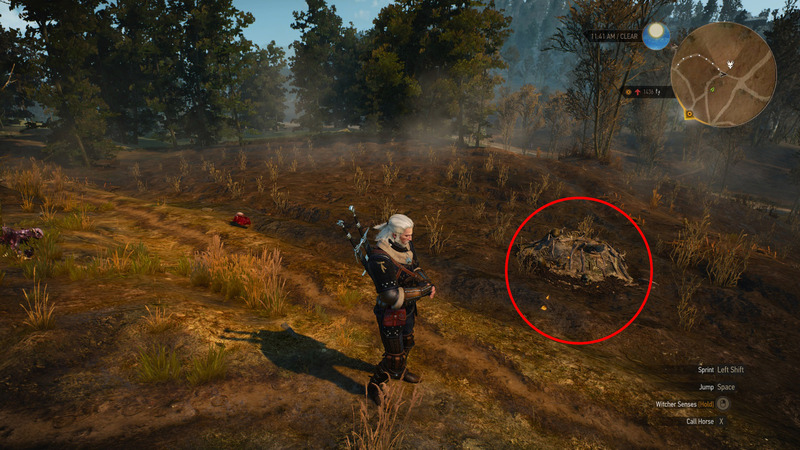 Having played my fair share of HOWGs, I find that the problem of size and lack of unique content manifests itself in several ways common to most of them,The Witcher 3 being no exception. One such distinguishing characteristic is a world filled with NPCs who don’t really do anything of substance. They endlessly plough the same square meter of field and repeat the same phrases and stories each time you pass them, exactly like setpieces in a Disneyland ride. They move and they talk, but they don’t contribute to the feeling of a living world. Another hallmark of sandbox games is the poor pacing of the narrative – or rather, the poor pacing caused by the inevitable deviation from the main quest for what is often substantial lengths of time. There’s always a considerable sense of urgency, which invariably is naught but hot air. 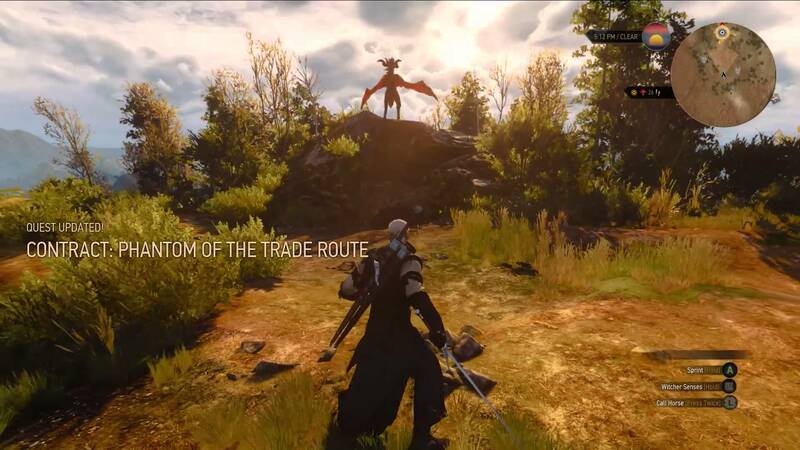 While the fate of the whole world and all your loved ones depend on you, the game throws sidequest after sidequest in your general direction (which, in the case of The Witcher 3, may be 30 levels and 50 hours beyond you). All the urgent quests, major and minor alike, patiently wait for you in the quest log while you chase down some farmer’s lost goat, pick mushrooms for an old crone, or investigate a mysterious call for help that’s very obviously a trap but hey, the Quest Marker™ beckons. And the pacing problems aren’t limited to the main storyline: When it’s “buy one, get five” for new minor quests, it’s nigh impossible to finish each one undistracted from start to finish, which is how the narratives are best enjoyed. A third characteristic of HOWGs is what game critic Mark Brown calls kitchen‐​sink design, where “every game seemingly needs to have two dozen weapons, a crafting system, micromanagement, and hundreds of side missions.” And let’s not forget pointless collectibles (thankfully absent in The Witcher 3), or racing, whether using spaceship or car or carriage or horse, which are often trivially easy to win. Put simply, there’s too much filler content that does not add to an overall coherent experience. The fourth characteristic I see in most HOWGs is the lack of substantial content in the game world. 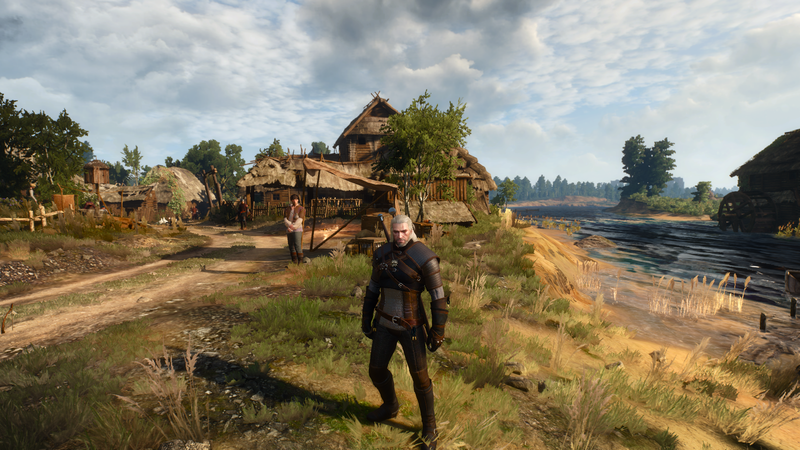 The Witcher 3 is wild and beautiful, but rather empty. Sure, there are a lot of settlements,1 but more often than not, each is more similar than the last and contains nothing interesting save for a generic notice board providing new quests. Not to mention the scattered monster nests which are completely identical no matter the monster (and which always has Geralt deliver the same line as you walk up to it), or the many abandoned settlements which all give you the same generic repopulation cutscene each time you clear out the bandits. All monster nests look like this, and you drop a bomb in it to mark it as “completed” on the map screen. The second overarching problem with The Witcher 3 as well as a great many other games these days (most notably, but not limited to, HOWGs) is one of the high‐​level gameplay. To paraphrase Mark Brown in his excellent video Following the Little Dotted Line, you spend most of your time operating in an artificial video game layer sitting on top of everything else. This makes it hard to be truly immersed in the world. The title of Brown’s video refers, of course, to the omnipresent “GPS” system in most modern games. You’re not following the directions given to you by NPCs (which often are utterly inadequate anyway); instead, you’re either beelining toward the yellow marker, or if you can’t even be bothered to find the best way to the marker, you just travel along the dotted line on the minimap. This goes for general exploration, too. Open‐​world games seem to encourage exploration by placing a variety of icons on the map, which often change to indicate you’ve visited/​completed/​looted a location. I find this extrinsic motivation for exploration tedious and artificial. It’s easy to fall into a mindset where the act of discovering new locations and taking in the views becomes secondary; a mindset where the goal is to quick‐​travel and gallop around the world to eradicate icons from your map. We all know the quest marker is the real boss around here. Combine glowing containers with the fact that A) you need lots of food to keep your health up at higher difficulties, and B) most of the time there is absolutely no consequence or penalty for looting anything, whether some poor farmer’s last water bottle or silver platters in a fashionable estate, and the result is you end up holding the right mouse button and mashing E (open container) and Space (loot everything in container) as you walk past barrels, sacks, and crates throughout the game. And there you have it – not a game within the game, but an artificial game layer on top of the game which pulls you out of the world and does absolutely nothing to help the game be what it wants to be. And with randomly generated loot in containers, you can end up with other weird immersion‐​breaking effects. Why they keep broken rakes in the dresser in Novigrad’s most fashionable brothel is beyond me. Another artificial mechanic is the hunting for yellow exclamation marks to start new quests. 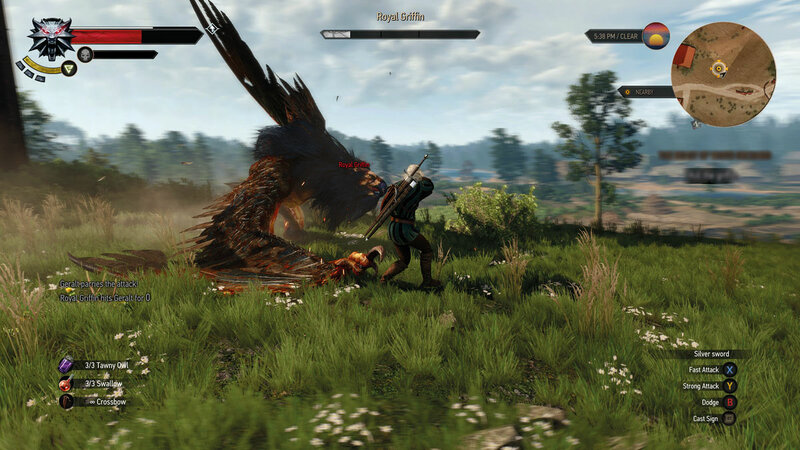 Thankfully, The Witcher 3 is not completely dependent on this, and several quests can be started in multiple ways. The “yellow exclamation mark” route is to be given a contract to kill a monster, either by reading the notice board or by first happening upon the person that posted the contract. But you can also just happen upon a corpse and some suspicious footprints during your travels and decide to investigate, and after finding and killing the monster, the last task will be to see if there was a contract for this monster somewhere, completing the circle. 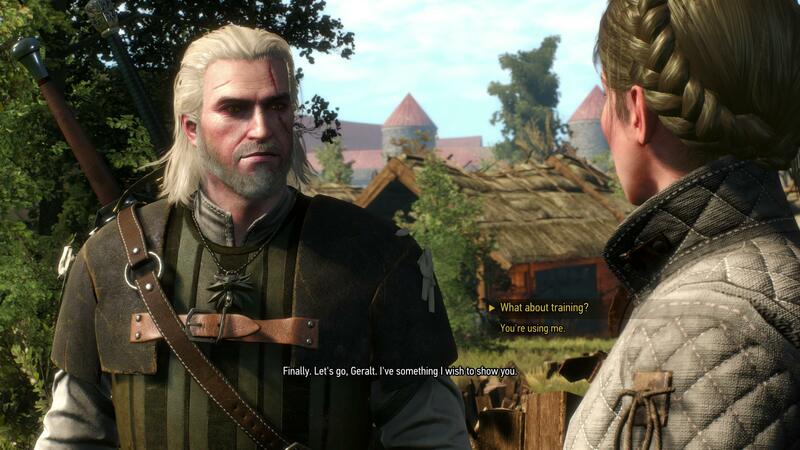 It mostly works well, but occasionally this too can be a bit artificial, with Geralt being embodied with knowledge he should absolutely not possess having started the quest that way. Time to do what Geralt does best. I realize full well I have spent most of the review underplaying the game’s strengths and elaborating quite a bit on its weaknesses, but while many might accuse me of giving the game an unreasonably hard time, it does reflect my feelings while playing: During the latter half of the 80 hours I spent on it, I just wished the game would end. I had seen everything substantial it had to offer, and the only thing keeping me playing on was my own investment in the game’s universe and my desire for closure. I have no problems seeing why other people like the game so much, but for me, this was where I finally understood that games boasting of an immense open‐​world has actually become a turn‐​off for me. If a game’s marketing campaign include the phrase “square kilometers”, that’s a red flag. Game worlds should be measured in unique content, not physical size. Most of the games I enjoy are packed with details and free from padding. They know what they want to get across and how to do it concisely. Sure, The Witcher 3 is a far cry from the pointless filler content of the Ubisoft sandboxes, but it’s still too little butter spread over way too large a loaf of bread. I am grateful to The Witcher 3, though, for having finally made me conscious of the pattern of so many 50+ hour games, which made me realize that I should probably steer clear of these games in the future. Well, until the next Zelda and Mass Effect come out, anyway. I’m grateful to The Witcher 3 for finally making me realize that I’ve grown bored of “kitchen‐​sink” games with way too much padding. I can see why people like it, I just didn’t particularly enjoy it that much myself. I disagree with you on several levels here. For me, The Witcher 3 is more or less the pinnacle of modern open‐​world gaming, which more games developers should look towards and learn from (yes, I’m looking at you, Final Fantasy XV). The open world is immense and inviting, and I for one never got tired of just walking/​riding around and explore the enviroment, just to see if I could stumble upon something interesting (and if not, then at least the view is gorgeous). The setting has been built up over several books and two previous games, something that truly pays off in this game. The characters are well written and masterfully brought to life thanks to excellent voice acting and animation (yes, even Geralt’s seemingly lack of emotion is so true to his character that I can do nothing but love it, plus it makes the humorous sequences even greater), and many of the story element – from the Bloody Baron to the line of succession in Skellige – is among the best stories I have encountered in video games in recent memory. Plus, the music is a great mix of relaxing and exciting. But I can agree that it grew a bit tiresome in the long run when listening to it in‐​game. When I finally let go of the game last Easter after 80‐​or‐​so hours, it was more out of necessity rather than boredom. So many things I could still do in the game if I wanted to, but alas, other video games (and real‐​life element such as friends and wife) also need my attention from time to time. The sidequests and NPCs could have used some more work, sure, but it never bothered me. Plus, I even found some of those to be genuinly entertaining (such as the Skellige sidequest where Geralt starts to ponder how to call a sheep when escorting it to use it as bait for a dragon‐​like creature). At the outset I, too, loved riding around to see if I could come across anything interesting, but since at least 90% of all interesting things are clearly marked on your map, tempting you with those mystical question marks, exploration for its own sake quickly lost its appeal. The views are really nice, I agree, but after 20 hours the novelty wore off as I grew more accustomed to the game’s natural beauty. Sure, there was always the occasional breathtaking vista throughout the rest of the game, but more often than not I’d simply think “oh, that’s nice” before moving on. The music, as you say, is excellent. I love both the soothing atmospheric tunes, the unnerving themes in the swamps, and the heart‐​pumping rhythms and vocalizing of the combat themes, the latter of which indeed set my heart racing in the beginning. There’s just way too little of it, and I quickly grew numb to most of its effects when I started recognizing it consciously and “singing along” in my mind. I also agree with you that some of the quest lines are very good for a video game, especially for action RPGs (the Elder Scrolls games don’t even come close). It’s certainly not the best as games generally go, but it’s good. To me, though, that speaks volumes about the sorry state of game narratives as compared to other media. Not that it is or even should be a fair competition; one can say much about the strength of video games being interactivity, not storytelling. But since the story is so large a part of this game, it’s certainly not unimportant, and as far as fantasy goes, maybe I’m just spoiled rotten by the intricacies of G.R.R. Martin’s world. 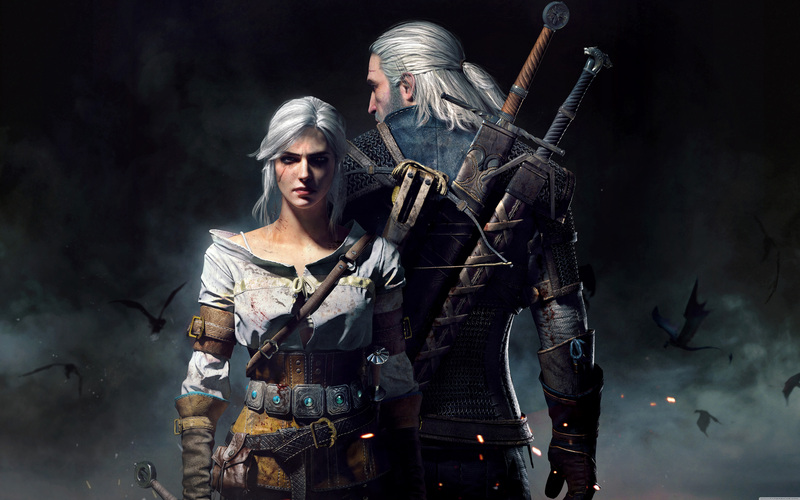 Even invested as I am in the world of The Witcher, the story in this game wasn’t able to captivate me the way I had hoped, and much seemed to happen just because the narrative required it. Case in point: the “here, sheepie sheepie” part. While funny, you somehow never needed livestock to catch a lot of other similar monsters in the game. Sure, it’s entirely possible that this was a special case and that it makes sense, but the simplest explanation, and one that is very hard to escape, is that this particular monster required a woolen sacrifice just for laughs. In summary, I, too, agree that The Witcher 3 is more or less the pinnacle of modern open‐​world gaming, and I have no problems seeing why other people thoroughly enjoy it. Maybe I just didn’t try hard enough to get into the game. Maybe I don’t really want to play such long games, just finish them so that I can move on to new experiences. Maybe my desire to cut back a little on gaming in favor of other pastimes makes me overly critical of new gaming experiences in order for me to subconsciously rationalize this shift. Maybe this was just a bad time for me to play this particular game. There could be a number of personal factors that highly influenced my experience and my focus while playing, and I don’t pretend that my review is in any way objective. I would love to give you a PS4 and let you play through Final Fantasy XV, just to let you play The Witcher 3 again later just for comparison. I think I have the same problems with FF XV that you have with the The Witcher 3: The game tries so hard to be a good open‐​world sandbox game, but ends up showing some of the fundamental problems with the genre. No amount of graphics and music can disguise that. Whereas The Witcher 3, in my book, nails just what it takes to make a game in that genre interesting and immensive. If you however want an open‐​world RPG where not everything is spilled out for you on the map, but just allows you to explore and see for yourself, you might want to boot up your old Wii and play Xenoblade Chronicles.